We did not forget about the review that was supposed to come out yesterday, we really didn’t 🙂 We intentionally took a break to get a more complete picture. So, on April 8, Bitcoin updated its annual high ($5,373), and the capitalization reached a record breaking $185 billion. Today, all 100 major cryptocurrencies are in the red area in terms of capitalization. The Bitcoin price is $5,218, its capitalization is $179 billion. 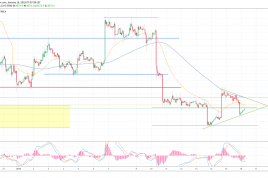 The price is still unable to reach the $5,400 level and the hourly chart shows a rising triangular formation with a likely movement upwards. The moving averages indicate the prevalence of an uptrend. At the same time, EMA50 acts as a support at $5,225 being the price level as of this writing. EMA100 at $5,062 will also hold back the decline in the event of a correction. MACD indicator, however, is tending to the neutral area, but it is probably just “cooling down”. On the 4-hour chart, the price is moving along the lower boundary of the ascending triangle. The moving averages are tending upwards, EMA50 is above EMA100 supporting the buy signal. MACD indicator does not agree with the moving averages and has been going down for the last five days. Does it indicate divergence? Let us not make hasty conclusions. Support levels on the 4-hour timeframe are at $5,100, $ 4,950 (EMA50) and $ 4,800-$4,780 (0.5 Fibo). On the daily timeframe, the moving averages have formed a buy signal – ЕМА50 ($4,295) has crossed ЕМА100 ($4,190). MACD indicator is in the positive area. The growth targets in case the price gets out of the triangle will be at $5,400 and $ 5,800 levels and the return to the level above $6,000 level to $6,150. At the same time, a correction to Fibo 0.5 and 0.61 ($4,780 and $4,640 respectively) cannot be excluded. As Bitcoin continues to grow, an increasingly large number of positive forecasts regarding the main cryptocurrency’s rate is coming out. 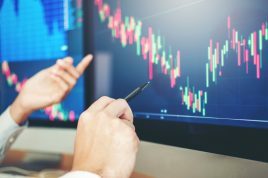 For instance, Zhao Dong, a well-known OTC trader, believes that as a result of the halving scheduled for May, the price will be at crossroads: before that event, the price will trade within the $4,000 – $6,000 range, as it draws nearer, the price will reach $10,000, immediately after the halving, the price will fall to $6,000 – $7,000 to subsequently rise to $50 – $100 thousand in 2021. Earlier, analyst Josh Rager predicted the beginning of a sharp growth of Bitcoin in mid-July. He came to that conclusion by comparing Bitcoin rate dynamics in 2015 and 2019. According to the trader’s long-term forecast, the rate will be about $150,000 by 2023. Yesterday, April 8, the market saw suspiciously active operations by Chinese on OTC platforms. They started to massively buy USDTs at prices exceeding the coin’s nominal price. Huobi and OKEx OTC platforms are crowded by Chinese investors buying Tether token at 7 yuan, while USDT official rate is 6.7 yuan. Such a great interest is caused by the ban on cryptocurrency exchange activities and ICOs in China, therefore, local investors are forced to buy USDTs on OTC platforms in order to subsequently buy bitcoins or other digital coins there. 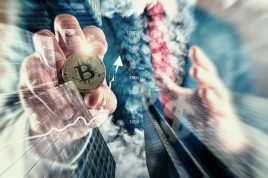 The growing number of search queries indicate the increased interest in the cryptocurrency market. 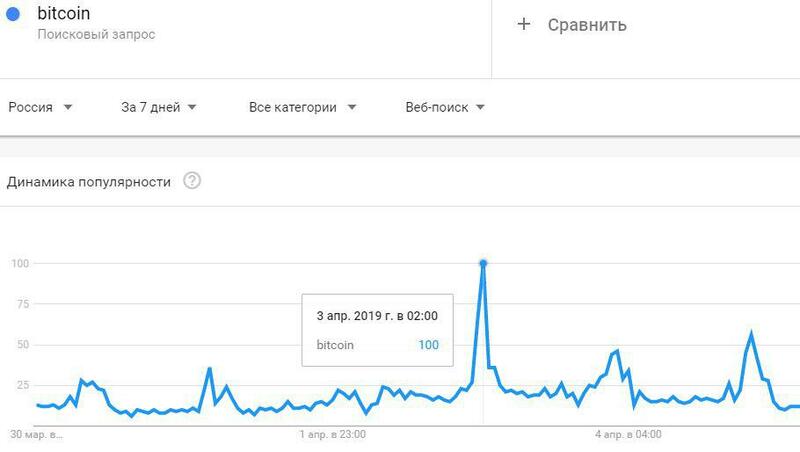 According to Google Trends, the number of search queries containing the word “Bitcoin” has tripled since the sharp increase in the price of the world’s first cryptocurrency was recorded at the beginning of the week. As per Google Trends data, the largest number of queries has been coming from Nigeria, the Netherlands, South Africa, Austria and Switzerland. Despite the surge of positive sentiment in the market, its participants are not as optimistic as they were during the previous price hikes. Some believe that the price is kept artificially high by a number of investors interested in “pumping”. This theory is supported by the fact that the load on blockchain coins has decreased immediately after the beginning of the correction. Bestchange.ru Senior Analyst believes that it may indicate manipulator activity. 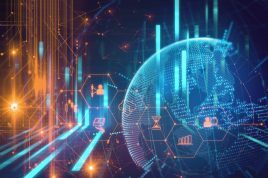 He noted that the number of transactions awaiting confirmation in the mempool had dramatically decreased, which may lead to a drop in the rate. We never do market orders, we always place pending orders instead. In the current situation, orders can be placed closer to support levels ($4,095), as well as short buy stop orders can be placed at the exit from the triangle in the upwards direction. The resistance levels are strong and growth targets are clear.